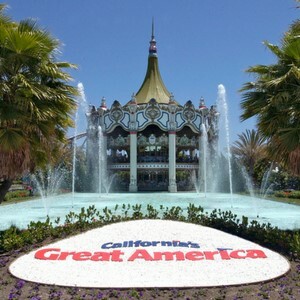 Save on California’s Great America theme park when you spend a night at one of 10 Santa Clara hotels. Hotel/theme park packages represent an almost 50% savings over regular room and ticket cost, starting at $159 plus sales tax. For details on each participating hotel and/or to book online, visit SantaClara.org/HotelPackages. Packages include one night’s weekend accommodations and two California’s Great America general admission tickets (extra tickets can be purchased at a discount at several of the hotels). In addition, a few of the packages include free breakfast and transportation to and from the park. Hotels are Avatar Hotel, Best Western Inn Santa Clara, Biltmore Hotel & Suites, Embassy Suites Santa Clara, Hilton Santa Clara, Hyatt house, Hyatt Regency Santa Clara, Mariani’s Inn and Restaurant, Santa Clara Marriott, and The Plaza Suites. Packages are good thru October 28, 2017, and subject to availability. For 2017 California’s Great America will introduce “Patriot,” the first floorless coaster in the park’s 41 year history. Patriot takes riders to a 91-foot height before plummeting them into a 360-degree loop at 45 miles per hour. Patriot’s position in the park makes it a dynamic visual from three different sections of California’s Great America.